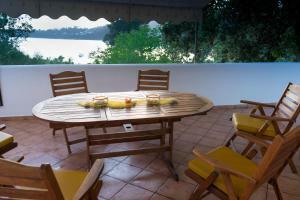 The place was spotless, spacious with huge verandas all around it with views of the beach and the mountains. There is nothing negative about this place. The owners are just the best you could ask for, they go out of their way to make you feel welcome and comfortable. Everything was perfect! Especially the friendliness and helpfulness oft the owner family made the holiday to an unforgettable experience! !A big thank You and warm greetings Form Austria! Helmut with family! 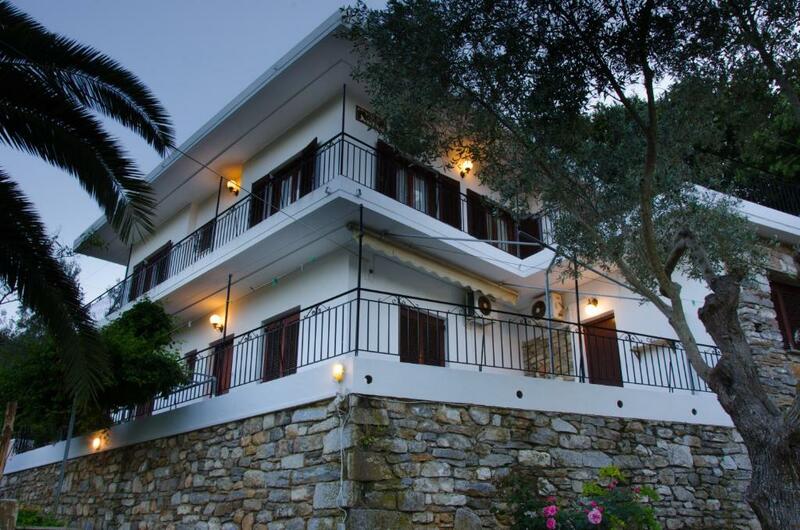 Villa Mitsa is a wonderful destination for a holiday in Skiathos. It provides a very comfortable spacious apartment in an ideal location. 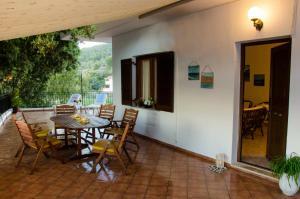 The apartment is very well appointed and has a large terrace with wonderful sea views. Kolios beach is minutes away with the lovely beach at Vromolimnos only a ten minute walk round the corner. There is also a small Supermarket and Bus Stop within easy reach should you wish to travel into town in the evening or visit other beaches on the island during the day. Soula is a very attentive host without being intrusive and nothing is too much trouble to make your holiday an enjoyable experience. Thank you Soula for giving us such a wonderful holiday and we would not hesitate to stay with you again. We had such a warm welcome from Soula and her lovely parents who treated us like part of their family. The villa was spotlessly clean and very spacious. 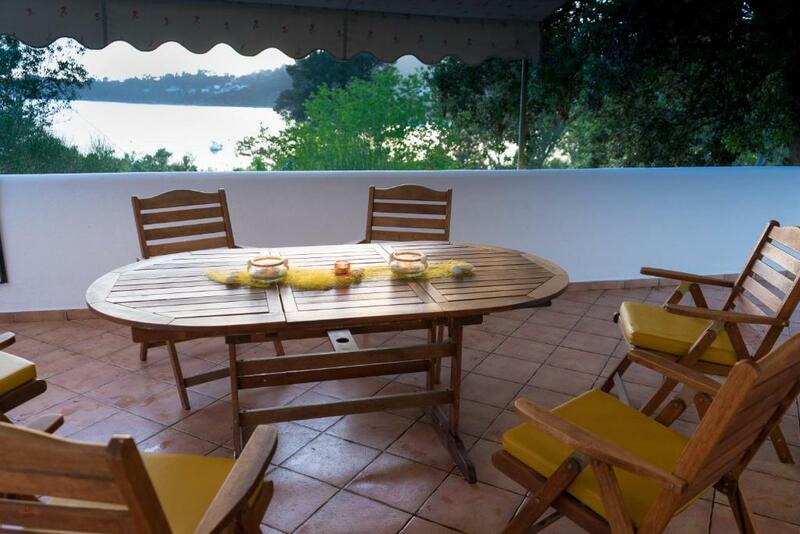 It was in a lovely quiet location with view of the beach which was a 2 minute walk away. We especially enjoyed using the lovely veranda and wish we had one at home! The bus stop and some lovely tavernas are a short distance away. We would highly recommend Villa Mitsa. Soula was a wonderful host who really could not enough for you. The property is exceptional, beautifully located, very clean and comfortable. I would not hesitate to recommend this villa to anyone looking for a base for a fantastic holiday- we will definitely be returning. Soula and her family could not have been more welcoming and hospitable. The apartment was spacious and spotless. The enormous terrace gives a real wow factor. It was very well equipped and Soula would do a quick clean daily and changed the sheets and towels mid week. We had one morning of rain but the apartment is very comfortable indoors too with a big sofa and armchair or you can sit outdoors sheltering under the big awning. The location is 30m from the Kolios beach and 5 min walk from Vromnolimnos which has water sports (or you can swim round!). There is a small supermarket at the end of the lane. There are good restaurants near by and if you don't have a car, the bus stop for trips further afield is opposite the shop. The hosts were so friendly, around when we needed them but let us relax and enjoy our holiday. We felt so welcome! The facilities were amazing, beautiful large balcony with lovely views. Water replaced every day. Facilities lovely and clean. Very short walk to two beaches and close to supermarket and bus stop to get into town. Exceptionally clean, lovely, pretty personal touches around the villa. Well stocked, even down to little tea lights and Mosquito plug ins. Soulla the owner is very helpful and on hand with any thing you need. Cleaned every day Very private, the patio area is extremely spacious. 2 minutes from Kolios beach, in fact it's just around the corner. Handy for the little supermarket that stocked almost everything except for fresh meat or fish. Taverna's near by. Would definitely stay here again. 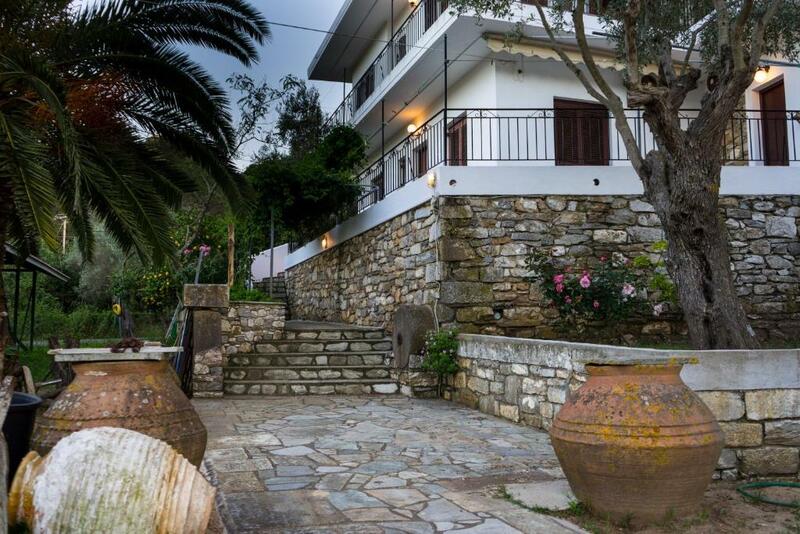 Lock in a great price for Villa Mitsa – rated 9.8 by recent guests! One of our best sellers in Kolios! Surrounded by lush greenery and 100 feet from Kolios Beach, the quietly located Villa Mitsa, offers family accommodations, fully furnished with a very large shaded terrace with sea and countryside view. 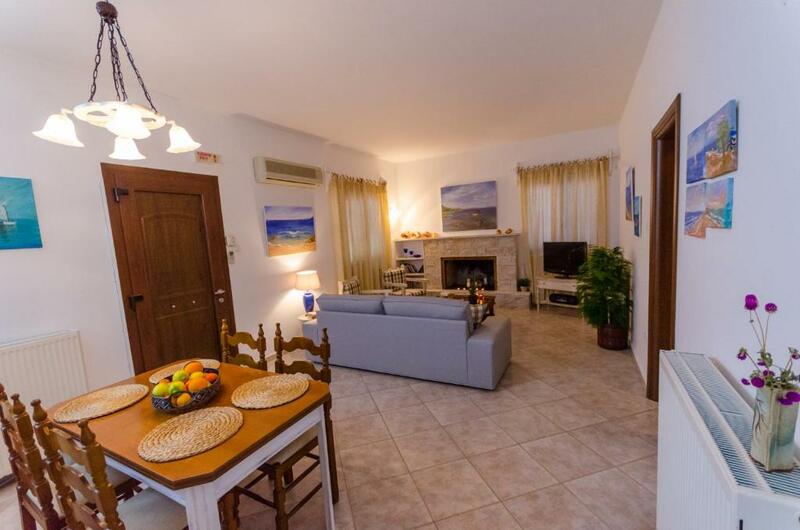 Split in 2 levels, the villa is stone-built and features relaxing, air-conditioned interiors. It includes a fully equipped kitchen with an oven, and all kitchen necessities. The living room offers a flat-screen TV and a sofa bed. The terrace offers sunbeds for relaxing times. Free WiFi is offered throughout the premises. The main town, the port and the airport of Skiathos are 3.7 mi away. A bus stop, as well as super markets and tavernas can be found within walking distance. The popular beach of Koukounaries is 3.4 mi away. 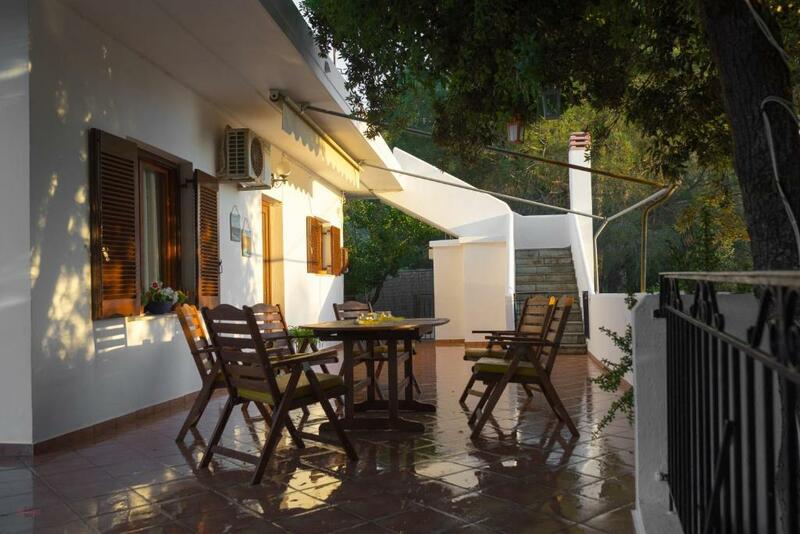 뀐 Located in the top-rated area in Kolios, this property has an excellent location score of 10.0! When would you like to stay at Villa Mitsa? This villa has a microwave, tea/coffee maker and seating area. 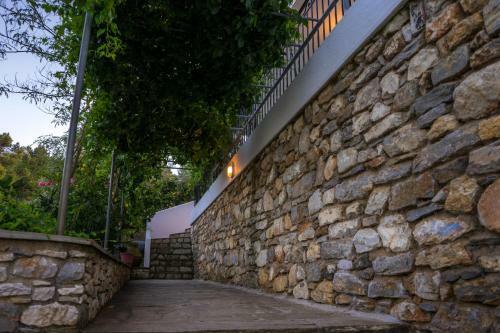 Surrounded by wonderful greenery in the greater vicinity while being situated next to Kolios beachfront, the quietly located Villa Mitsa in Kolios area of Skiathos, offers wonderful family accommodation, fully furnished with a very large and shady terrace which full beach and hills view. The property is 100 m from Kolios Beach. 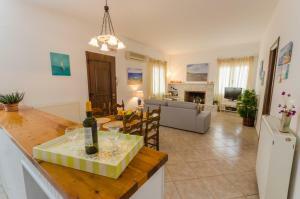 The villa is stone-built and features fully-furnished, relaxing interior. It includes a fully equipped kitchen with an oven, and all kitchen necessities. The living room offers a flat-screen TV and a sofa bed. The terrace offers sunbeds for wonderful relaxing times. Free Wi-Fi is offered throughout the premises. Skiathos port is 5,5 km away and Skiathos airport is at 7.0 km. A bus stop can be found at 300 m and guests can access the rest of the island to the western part in less than 6 km distance. House Rules Villa Mitsa takes special requests – add in the next step! Please inform Villa Mitsa of your expected arrival time in advance. You can use the Special Requests box when booking, or contact the property directly using the contact details in your confirmation. There is nothing negative about this place. The owners are just the best you could ask for, they go out of their way to make you feel welcome and comfortable. The owners, the view and the overall space.